If there exists a list of historic homes in America that must be seen in one’s lifetime, Biltmore must surely be at the top. This magnificent Vanderbilt estate situated in the hills and mountains of Asheville, North Carolina, has the elegance and the grandeur of European castles complete with beautifully manicured gardens, vineyards, and panoramic views that seem to reach out forever. It is a house that was made of stone but forged by creativity, will, and ingeniousness and, deservingly, has become a National Historical Landmark. Upon entering the grounds, visitors are first directed to the visitor center where tickets are purchased and historical information regarding Biltmore can be obtained. One must be warned in advance, visiting Biltmore, even if only for a day, can be rather expensive, but it is an experience one will never forget. After ticket purchases have been made, visitors leave the center, following a narrow but paved road, and are directed to travel toward the parking areas. Attendants are numerous along the route, so visitors will have no difficulty determining where they need to go. Although the solo traveler can easily enjoy Biltmore, it may be best enjoyed by couples that wish to stroll through the gardens together while discussing the history of Biltmore learned during the tour. Additionally, though historians of all ages will enjoy Biltmore, the grounds, and the activities available on the property, young children will likely quickly grow bored with much that is offered. Visitors to Biltmore have much ground to cover, so wear comfortable shoes and be prepared to walk. If it is spring, fall, or winter, be sure to pack a jacket or coat that can be easily carried between indoor and outdoor activities. Perhaps most importantly, arrive early in the day because there is much to see and do. Once parked, the Biltmore experience truly begins as visitors walk along a shaded path toward the house. Then, as the trees thin and the sunshine brightly streams down, in the distance, is the first full view of the incredible mansion. Walking along the long paved drive toward the estate in the full light of the sun, one begins to realize the impressive size and detail of the house exterior. The house tour is thorough, educational, and entertaining, and leaves visitors in awe of the art, the architecture, and the history of the family that built Biltmore. Ropes are in place to guide visitors through the home in such a manner so that rooms may often be seen from various angles and so that each visitor has an opportunity for a clear view of the room. 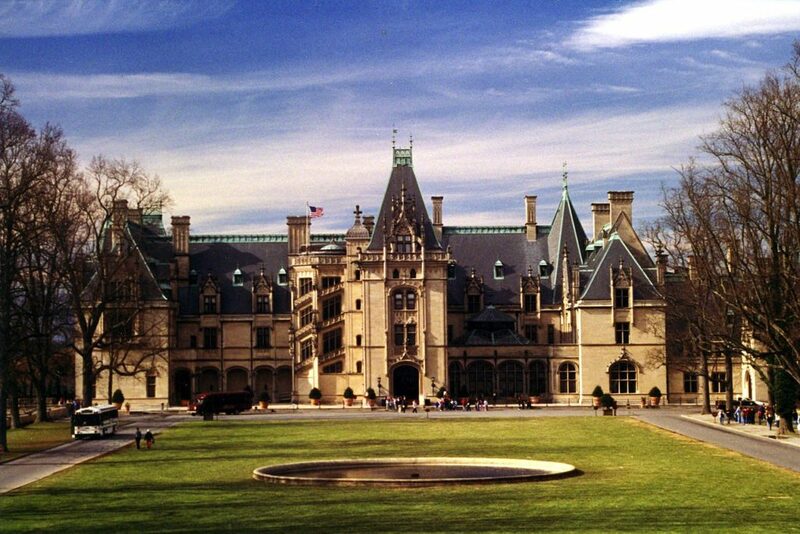 Biltmore was built, in a sense, before its time, with conveniences and extravagances that were extremely rare at the time of construction; the house tour explains it all and offers each visitor an opportunity to visually study this incredible home. Once the house tour is complete, there are plenty of options. There is a small outdoor eating area surrounded by vendors if one is need of a snack. However, after re-energizing, there are many more activities to enjoy at Biltmore. Whether one is an avid horticulturist or not, they will likely find the grounds of the estate breathtaking. From their appearance, great care is taken in determining shapes, sizes, and colors of plants to use in particular locations. When walking through the gardens, they seem endless; one is no more through one particular garden when a glance around a bend, over a small slope, or down a path reveals yet another splash of colorful plant life. The Biltmore home is the primary attraction of the estate, but the winery adds an important historical spin to the tale of this property. The walking tour of the winery provides information on how the winery began, its current practices, and the process of making wine. After being led through the winery, the tour ends at the winery store where taste tests are offered and wine can be purchased. Just down the road from the winery is River Bend Farm, the part of the estate that children will likely most enjoy. Animals can be viewed up close, crafts can be seen, antiques are on display, and snacks can be purchased. But, the estate offers even more. Biltmore has a multitude of outdoor activities, each, of course, requiring a fee in addition to the admission to the estate. Carriage rides, horseback riding, bicycling, and water activities are available. Biltmore has an Inn where guests can stay overnight and spa services that are available for purchase by the overnight guests. And, best of all, Biltmore has locations where visitors can simply sit and admire the view. Asheville, North Carolina, has a wonderful arts and crafts community, numerous interesting attractions in and nearby Asheville, and a fascinating history of its own, but this hospitable southern town may be best known for Biltmore. And, considering the enduring legacy of this great house, is it any wonder?